Do you like to peek into other people’s studios and workspaces as much as I do? I’m making a start on a couple of new projects, so I spent some time this week cleaning up my studio. (You call it procrastination, I call it an important part of the creative process!). Which means that right now is the perfect time to show you around the studio! This space needs to fulfil several purposes. 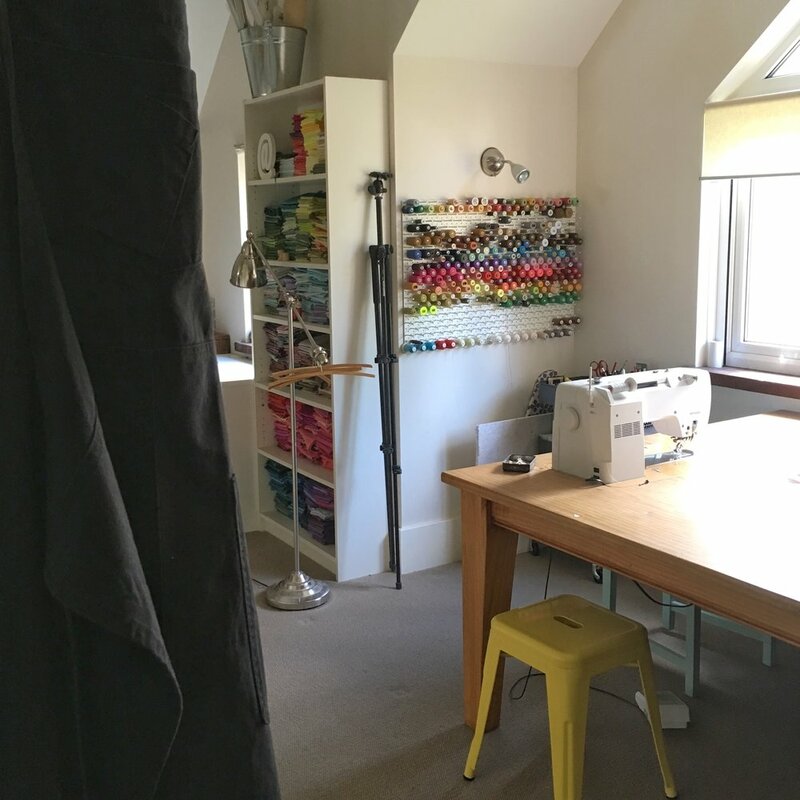 First of all, it’s the place where all my messy creative work happens (hand stitching and sketching often happen in the living room) so it needs to cater for cutting, sewing and screen printing. 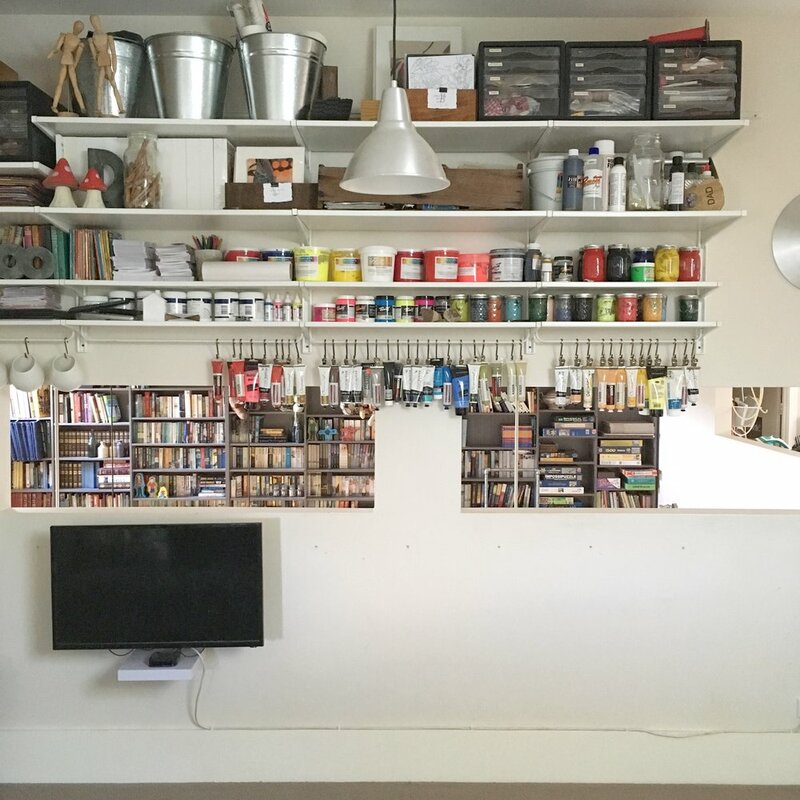 It also needs to store art making supplies and equipment, along with finished artworks and products as well as framing and packaging supplies. On on top of that, this room is part of our family home and includes space for the creative activities of six children, along with a small ‘home theatre’ (it’s the best place in the house for this). I love working at making sure my studio (and the rest of my home) is set up to work effectively for us. This means that as requirements and priorities change, so does our home. You can see a studio peek from some years ago over here, to see how things have changed here. The studio is a awkward, roughly L-shaped room with raked ceilings. It is located above our kitchen and laundry and has window openings that look down onto the dining and living room. (We designed it this way, to maintain a connection between the studio and the rest of the home. 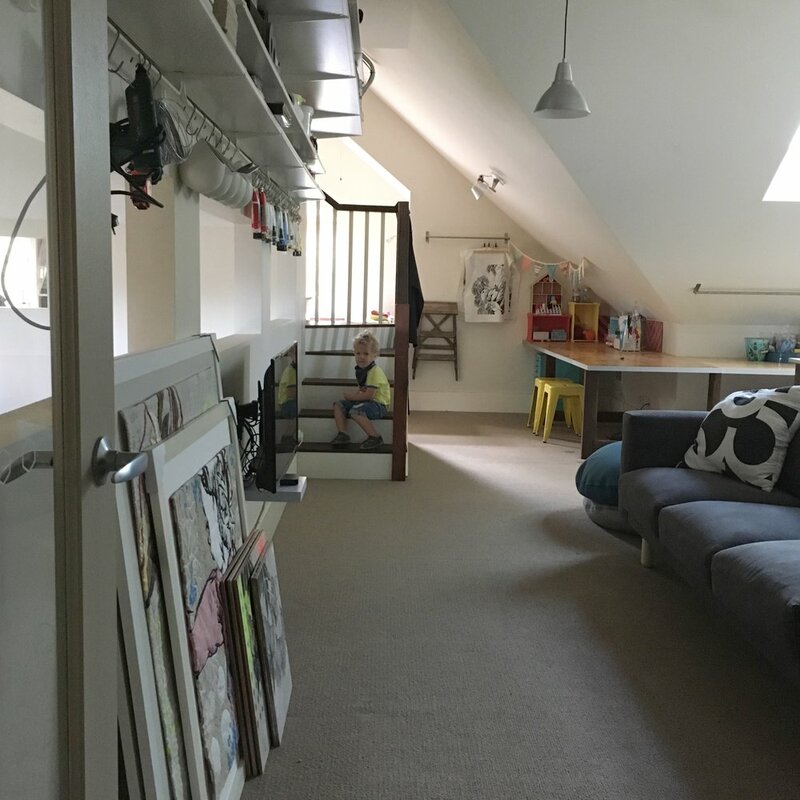 I knew that as a stay-at-home Mum, I wouldn’t be able to get into my studio half as often if it was too separate from our living spaces!). Entering the studio from one end, there is an artwork storage cupboard that my husband Phil built (spoiler alert: Phil built most things in this studio!) . 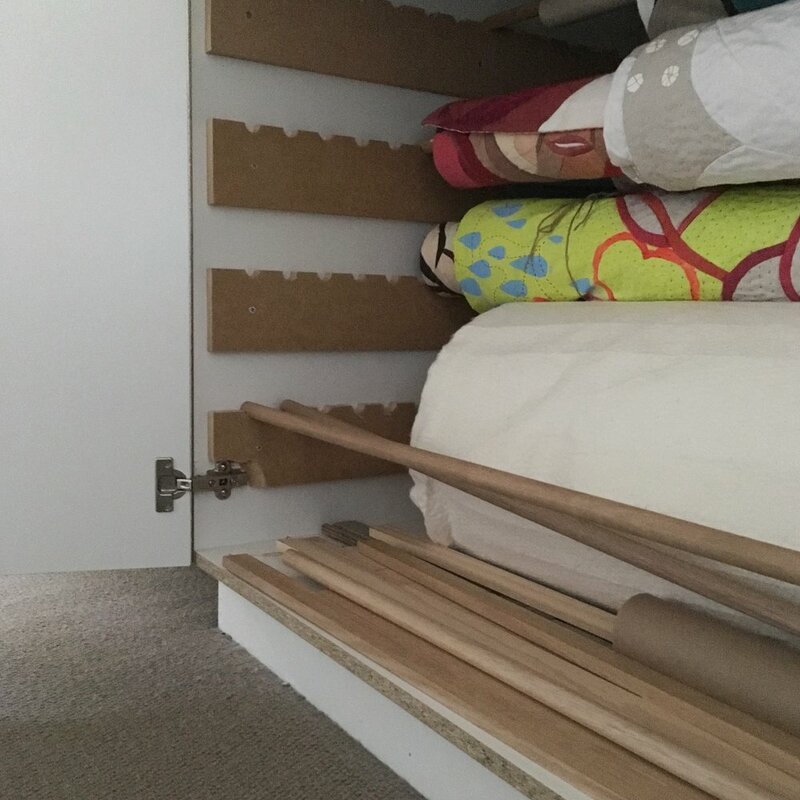 This cupboard allows me to store completed art quilts rolled up and away from dust and sunlight. (It’s to the right of this photo). Moving on, we find our tiny ‘home theatre’ which consists of a small wall-mounted TV and a comfy couch. It gets used primarily in July when Phil enjoys the Tour de France, while I sew like a woman possessed. We also use it for family movie nights throughout the year. And it’s the perfect place for toddlers to nap close by to where Mum is sewing. Behind the couch is my cutting/printing table. 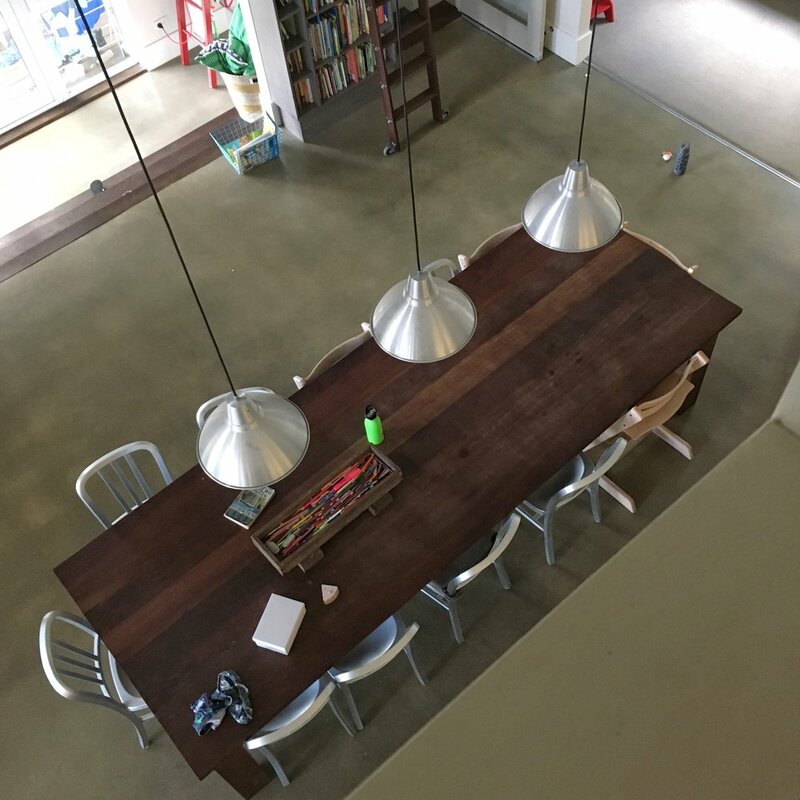 I love that it is higher than a regular table, and that it has a shelf for storing larger items on. When I use it for screen-printing, I unroll the wadding/fabric sandwich that is stored on the hooks at the end of the table, and spread that over the table - it makes a perfect printing surface, and also protects the table. Under the raked ceiling is a storage unit that was custom built for those black crates that we picked up from our local salvage yard. We love these crates, and use them all through our house. They are sturdy and also stack on top of each other if necessary. These ones containing framing and packaging supplies, as well as some craft supplies for the kids. Behind the cutting table is my design wall, perfect for reviewing works in progress, or for photographing completed artworks (that is what those two black studio lights are used for). I love my studio very much, but one thing I would change in any future studios, if possible, would be to make this three times as wide! Continuing around the corner, we find my sewing spot. I love sitting here by the window - the light is perfect. My sewing table is our old square dining table. Phil has modified it to accomodate my sewing machine, so that it is basically a large quilting table. And of course, the most important element in the studio would have to by my Bernina 710 sewing machine. I’ve been a Bernina girl ever since I started sewing on my machine. I only ever use basic functions, so I wasn’t very interested in fancier models, until this one came out with extra throat space. I’m so happy to have that extra space for man-handling my larger artworks! Past the sewing table, there is more storage (mostly fabric and sewing supplies) and an ironing station. These are IKEA Billy bookcases - perfectly versatile storage! The ironing station looks like a mess of power chords - that’s because this iron doesn’t switch itself off at all, so I’ve set it up so that when I turn the iron on, the light above the ironing board switches on. I live in fear of forgetting to turn off the iron! Thank you for joining me! Now to get on with making new messes here!